HAMBURG, Germany, April 3, 2019 /PRNewswire/ -- Collins Aerospace, a unit of United Technologies Corp. (NYSE: UTX), has won two awards across two categories at the 13th Annual Crystal Cabin Awards. Each award was carefully judged and selected by a panel of 28 industry experts on the basis of enhancing the passenger experience through innovation, comfort and convenience. The Collins Aerospace μLED Reading Light is a small reading and dome light that works in unison with the cabin lighting system to create scenes that synergistically add to the general cabin environment. The Collins Aerospace M-Flex™ Duet is a revolutionary cabin monument designed to transform the least optimized area of the cabin, the aircraft doorway, into a self-serve social zone or cabin attendant working area. A winner in the Cabin Systems category, the M-Flex™ Duet is a revolutionary cabin monument designed to transform the least optimized area of the cabin, the aircraft doorway, into a self-serve social zone or cabin attendant working area. During taxi, take-off and landing the compact monuments are stowed - meeting all regulatory egress requirements. 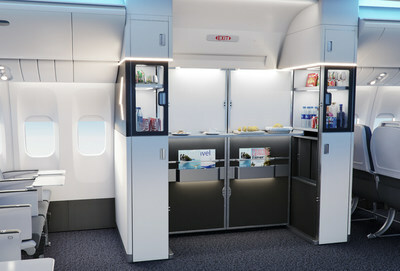 During flight, the units unfold to stretch across the doorway providing a stand-up, branded and self-serve social area for a passenger to enjoy food and drinks, and it also provides additional crew working space. Driving the aviation lighting industry forward, Collins Aerospace µLED Reading Light won the Material & Components award. The µLED Reading Light is a small reading and dome light that works in unison with the cabin lighting system to create scenes that synergistically add to the general cabin environment. An operator may choose a bright dome light for boarding or smaller, dimmed light for night time. This technology can adapt to different applications from a large spot, small target, non-standard and non-uniform shapes, as well as multi passenger applications. The Crystal Cabin Award is the only international award for excellence in aircraft interior innovation, donated by the Senate of the Free and Hanseatic City of Hamburg and released by the Crystal Cabin Award Association. 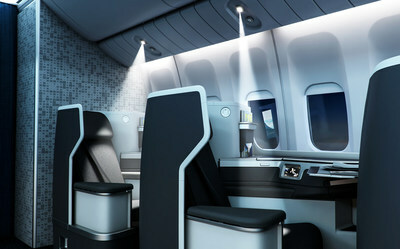 This unique honor for outstanding cabin products and concepts was presented for the first time ever on April 17th, 2007, during the Aircraft Interiors Expo in Hamburg. The Crystal Cabin Award's main intention is to initiate a significant improvement in passenger comfort.